Sultanate of Oman, as diverse as nature possibly could be, safe, colorful and hospitable. A country that has been witness to one of the oldest civilizations in the Arabian Peninsula, whose history can be traced back to almost 12,000 BC. Historical evidence traces the influence of different cultures from the Samaritans to the Persians. With the advent of Islam in 630 AD, the country attained regional prominence in 1741. Today, the country opens its doors to visitors from all over the world. Come and experience the fascinating array of Forts and Watch Towers that sing in glory of the past whilst the Mountains, the Wadis, the Caves, the Desert and the Architecture reminds one of the various stages of evolutions that this land has gone through to what it is today. 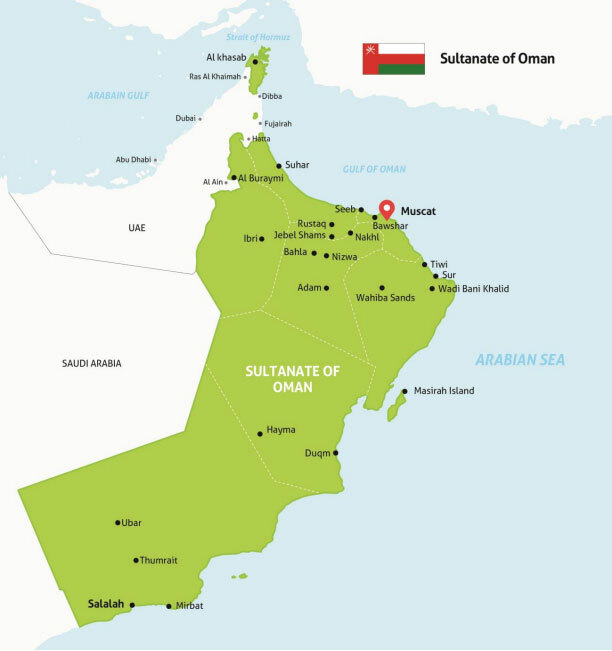 The Sultanate of Oman is +4 hours ahead of GMT in the winter. The Sultanate of Oman has a sub tropical arid climate. Sunny, blue skies can be expected most of the year. Rainfall is infrequent and irregular, but occurs mainly during winter. Temperatures are usually mild and pleasant during the months of September till May and can be warm and humid during the months of June to August with July and August being the hottest months. Light wear summer clothing is suitable for most of the year, but pullovers or jackets may be needed for the winter months especially in the evenings. A Conservative dress sense is an advantage in Muscat, especially for women, who should avoid wearing overly tight or revealing clothing. The Omani culture is firmly rooted in the Islamic traditions of Arabia. Courtesy and hospitality are among the most prized virtues and the visitor is sure to be charmed by the genuine warmth and friendliness of the people. Foreigners are free to practice their own religion, alcohol is served in hotels and provided reasonable discretion is shown, the dress code is liberal. Women face no discrimination and may drive and move around unescorted. Local citizens dress in ‘disdashsa’ (Robe) with a Furakha and’Muzzar’ or ‘Kumma’ (head dress). Arab culture and folklore find expression in poetry, dancing songs and traditional art. Weddings and other celebrations are colorful occasions of feasting and music. Traditional sports such as bull fighting, camel racing and dhow racing continue to thrive. Islam is the official religion of the Sultanate of Oman and there are a large number of mosques throughout the city. Other religions are respected. Ramadan is the holy month in which Muslims commemorate the revelation of the holy Quran. The timing of Ramadan is not fixed in terms of the Western calendar but occurs a few days earlier each year. Final dates may vary by 48 hours from the above dates depending on the sighting of the moon. It is a month of fasting when Muslims abstain from all food, drinks, and smoking during daylight hours. Visitors are also required to refrain from consuming these in public places during this period. Alcohol is not served during Ramadan period. Working hours in offices and opening times of museums, and places of interest in the country could differ from normal periods during the month of Ramadan. Alcohol is available in hotels and selected Clubs, Restaurants and Pubs. Alcohol is not served between 1500hrs & 1800hrs everyday except Thursday and Friday. On these days, alcohol service starts only from 1400hrs onwards. If alcohol is important during a meal we recommend checking this out with the restaurant before making a firm reservation. Normal can of beer – USD 8.00, normal spirit – 25 ml USD 8.00 premium spirit 25 ml USD 13 onwards. Photography is acceptable but is considered offensive to photograph Muslim women. It is also courteous to ask permission before photographing men. Photographs should not be taken of government buildings or military installations. The weekend is on Friday and Saturdays and the working hours for Government departments are from 07.30 a.m. to 2.30 p.m. Private Sector offices vary, but are generally open from 8.00 am to 5 pm Shop hours are generally 10.00 am till 1.00 pm and again from 4.00 pm till 10.00 pm. Many shops and the souks also open on Fridays between 5.00 pm till 10.00 pm. Embassy’s and Consulates are usually open Sunday To Thursday but it is recommended to check prior to a visit. Banking hours are Sunday to Thursday 08:00 am to 1:00 pm . The Oman currency is the Omani Riyal (OMR) which is divided into 1000 baiza. The Omani Royal has held constant against the US Dollar at a mid rate of approximately US$ 1 = OMR 0.380. Oman is an expensive destination. On an average a driver cost USD 92.00 per day, an English speaking guide cost USD 158.00 per day, tipping USD 13.00 per driver per day, a saloon car on self drive basis cost USD 40.00 per day, 4wd vehicle Cost USD 118.00 per day and a mini van cost USD 265.00 per day. Mini vans are allowed to drive by Omanis only. Expatriates are allowed to drive yellow plate or a rent a car vehicle. A normal international buffet cost USD 26.00 per person and an Indian meal cost USD 13.00 per person per meal. International credit cards are widely accepted at Shops, Malls, Restaurants and Hotels. Widely accepted credit cards are American Express, Diners Club, Visa and MasterCard. However smaller shops may not accept credit cards and it is recommended to carry cash. Some retailers also offer better bargains for cash. Money exchange centers are widely available in all the Cities. A supplement of 3 % fee is charged for all CC transactions.